The Hindu religion recognizes the influence and significance of our ancestors and other dear departed ones in our lives. According to the Vedas (the ancient scriptures of Hinduism), the spiritual soul transmigrates from one species to the next, evolving up through the 8,400,000 forms of life until he attains a human body. The human form of life has a special significance, for only in the human form is the soul’s consciousness developed enough to understand that the body is just a cage, and that there’s a way to free oneself from that cage to liberate oneself from the birth and death cycle. We owe our very existence to our ancestors and, consequently, we owe them an unredeemable debt of gratitude for offering us the most precious gift of all – a human life. On the other hand, our departed relations enrich our lives through all the experiences – good and bad – that offer us the means to relieve us of our karmic contracts and debts. Hence, the Hindu religion considers it the obligation of every individual to offer their gratitude to their ancestors and departed ones by performing the shraadh ceremony (a rite performed to bring salvation to departed souls) as per scriptural injunctions on their death anniversary day. Usually a person performs this ritual with reverence only for their immediate departed. The river Ganga is considered the most blessed of all and endowed with immense purification powers. Hence, Hindus visit the ghats (bathing platforms) of this holy river since ages to perform the shraadh ceremony to honor their parents, ancestors and other dear departed ones. This is considered to help the soul of the departed family member to be free from the pains of lower astral realms and clear their way to evolution to higher astral realms. The shraadh ceremony is done with the Sun as the witness and the river Ganga as the vehicle for offering the oblations to the departed. The departed are offered holy water, milk, flowers, sandalwood paste, etc. and the pind. The pind constitutes a round ball made of mixture of wheat and rice flour with some sesame seeds that are mixed along with some milk and honey. Mohanji had been doing Ammu’s annual shraadh ceremony for the last 11 years but had stopped it when he was guided by elders that 11 years was sufficient enough. Recently after Mohanji came back from Canada, a saint told him that he should continue the shraadh ceremony for Ammu for as long as his health would permit it. Respecting the words of the saint, which Mohanji always does, he decided to honor her beautiful soul by doing a shraadh ceremony in Rishikesh by the river Ganga this year. September 5th was Ammu’s death anniversary this year (2015) according to the Hindu calendar and so was Krishna Janmashtami (the birthday of Lord Krishna). Interestingly, the day Ammu passed away (August 23rd 2000) also happened to be Krishna Janmashtami according to the Hindu calendar. There is strong connection between Ammu and Lord Krishna. Swami Govindanandaji of Sivananda ashram once told Mohanji that he was sad that he couldn’t meet Ammu when she was in her body. He said that he was sure she was an amsha (part) of the consciousness of Krishna. There is an anecdote that I have read where Ammu mentioned to her grandmother that she could see and play with Lord Krishna when she was barely four years old. When her grandmother couldn’t see Lord Krishna and dismissed it as a childish fantasy, Ammu told her grandmother that her prayers are not strong enough. There is only one direct train from Dharamshala (actually Pathankot which is closest prominent railway station to Dharamshala) to Rishikesh. Due to Mohanji’s travel schedule and the saint’s guidance coming in late last month, the decision to do the shraadh ceremony for Ammu was taken at the last minute. Consequently given the holiday season, there were no tickets available in the general category. The alternative was to drive down from Dharamshala to Rishikesh, which is a long arduous drive. The venerable Mamu (“May his grace always be upon us!” as Mohanji lovingly says :-)) who handles Mohanji’s office decided to apply for the tickets in the Tatkal category – a last minute option that typically has a very low probability chance given the high demand for tickets. Getting a confirmed reservation in the Tatkal category in peak season is akin to winning a Lotto since it is easier to please the Lord than the railway authorities and their justly feared website which is flakier than snow. As usual, the Divine always takes care of Mohanji in every way. So we weren’t too surprised when we got confirmed train reservations for both the legs of travel. Of course, all thanks to Mamu’s grace, as Mohanji would say. We packed light and left for Pathankot in the evening. The venerable Mamu chose to drive us down to Pathankot in his sedan. This was a happy change over Mohanji’s driver Sher Singh (aka Mooch – the Moustache) and the ashram SUV. The way Sher Singh drives makes you feel that he drove an army tank in his past life where the concept of braking was alien. We winded over the gentle hills of Dharamshala and made our way through some real bad roads that would have been the pride of an offroading circuit. The sedan got tossed and bounced all through the ride. We were like James Bond’s martini – shaken but not stirred! 🙂 Finally, the road Gods also shined on us and we found the last stretch with the entirety of its surface intact. What a blessing! We reached the station well before time thanks to Mohanji’s principle of leaving a huge buffer to ensure that he is never rushed. We stopped at a restaurant outside the station and had a quick tea and snack. The train arrived almost on time and we quickly got into our compartment and then onto our seats. The venerable Mamu gave his pranaams (salutations) to Mohanji and left onwards to Jammu where he lives. We settled into our seats as the train left the station hurtling on its way to Rishikesh. Mohanji and I had gotten the lower berth thanks to Mamu’s efforts. For people not in the know, the berths of an Indian train are like the tiers of a bunk bed. My neighbors were a couple and their infant child. The husband asked me if I could let his wife have the lower berth since it would be uncomfortable for her to take care of the infant on the upper berth. I agreed to his request. His aged mother was Mohanji’s neighbor. Even though Mohanji was not asked, Mohanji immediately asked if his mother wanted the lower berth as well. She said that she would be grateful if he allowed it. The curvature of the roof of the train constricts the height in the upper berth. This is not an issue for someone my size. But for Mohanji, it would have been very uncomfortable since he could barely manage to fit into it. However, Mohanji immediately agreed. Hardly surprising given his life mantra of “putting others before self”! Mohanji got into a discussion with our neighbors. The couple was from Pennsylvania and they were currently on vacation in Jammu that was their hometown. They were headed to Haridwar that is a bordering town close to Rishikesh. From a spiritual standpoint, its stature rivals Rishikesh. The husband was a practising doctor in Pennsylvania with a specialization in infectious diseases. He asked about Mohanji and his mission. Mohanji explained the different aspects of Mohanji Foundation and Ammucare. They were visibly impressed by the honorary nature of the activities of the Foundation and its geographical spread across the world. Mohanji also spoke about his recent worldwide trips particularly his specific visits to the US this year and last. After this engaging discussion, we had our packed dinner that Devadasji’s wife had lovingly prepared for Mohanji. Mohanji decided to allow the family to rest, got onto the upper berth and tried his best to fit into it. Considering that he was recuperating from all the hectic back-to-back travel, it was sad to watch him go through all the discomfort. It was quite uncomfortable and he chose to lie down and work for a while. After a while, he decided to call it a night. Since I was carrying my brand new laptop, I chose to keep our luggage with me rather than risk it getting stolen. Hence, I also tried my best to fit into the berth with our luggage. To add to my woes, my berth was right next to the door of the compartment. So I had to be careful not to knock out any unsuspecting passenger entering the door with a kick or get my legs whacked by the swinging door. So the rest of the night was devoted to trying out creative positions to fit my body into what was left of the berth after our luggage. I had a fitful sleep. After an arduous journey, we reached Rishikesh. We got out of the station in search of a rickshaw to take us to the hotel. We hired a auto rickshaw who charged us almost 3 times the going rate. I know that Mohanji does not like to haggle with poor people so I just accepted his proposition. Mohanji asked me to check with an old couple at the rickshaw stand who were also looking for a rickshaw, to see if their destination was on our way and if they would like us to drop them there (for free). I had noticed this couple trying to get a rickshaw. They were looking for a share-a-ride rickshaw to reduce costs and were being refused by most of the rickshaw drivers. I took no further notice of them in my hurry to get us into a rickshaw and on to the hotel. Their destination was a little further down from ours. So they happily agreed. Mohanji personally helped them with their luggage and helped the old woman into the vehicle. 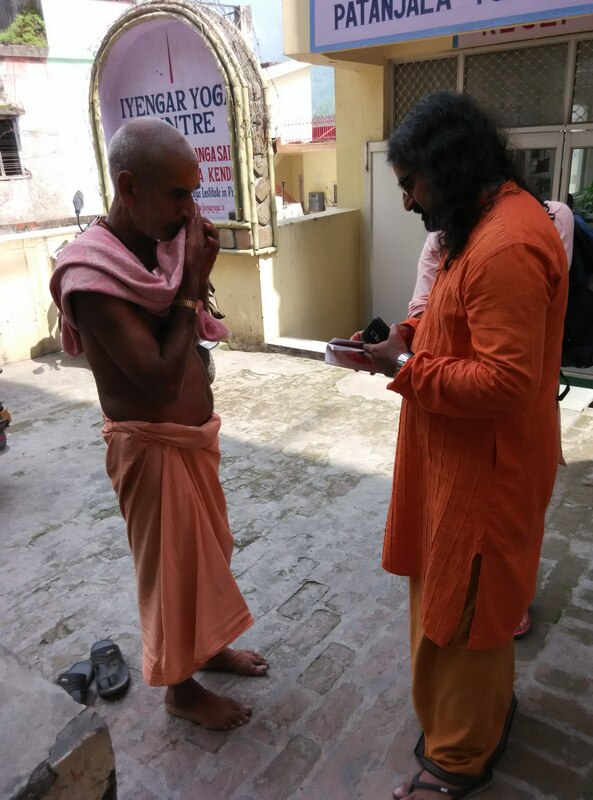 Mohanji enquired about their purpose for being in Rishikesh. They said that were planning to stay there for an extended amount of time. Mohanji also asked them the location of our hotel since the driver did not know the exact location. The old man mentioned that it was a short distance before their destination. As we passed our hotel, Mohanji told the rickshaw driver to continue on and first drop the old couple to their destination. They thanked us and went on their way. Mohanji asked me to pay the rickshaw driver 10 rupees more since we had taken two more passengers (for free) and changed the earlier deal. Two lessons that Mohanji was trying to teach me 1) Always be fair even if the other person is not 2) Always be alert and ready to help people. Don’t get too caught in your own world and, thus, miss a chance to offer a helping hand. We walked our way back to the hotel. The room was nice and clean. The sweet spot was that it had a beautiful panoramic view of the river Ganga. We settled in, did our morning ablutions and charged our phones. Since one is not supposed to have food before the shraadh ceremony, we just had tea. Swami Govindanandji of Sivananda ashram had arranged for the priest and made all the other arrangements. We were requested to be at the Sivananda ghat in a couple of hours. Mohanji mentioned that he wanted to buy dhotis as dakshina (offering or payment for services of a priest) for the priests conducting the ceremony. 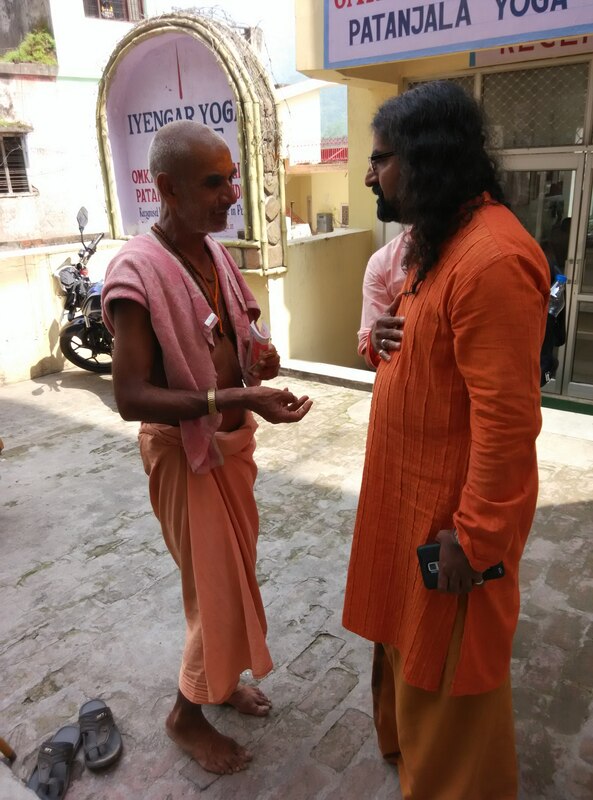 Mohanji is very well conversant with Rishikesh having spent a lot of time doing his spiritual practices here. He told me that the best place to get good quality dhotis at a good price in Rishikesh is the Gita Prakashan Vastra Vibhag on the other side of Ram Jhula (swing) – one of the two suspension bridges over the river Ganga that connects the two banks, the other being Laxman Jhula (named after Lord Ram’s brother Laxman). 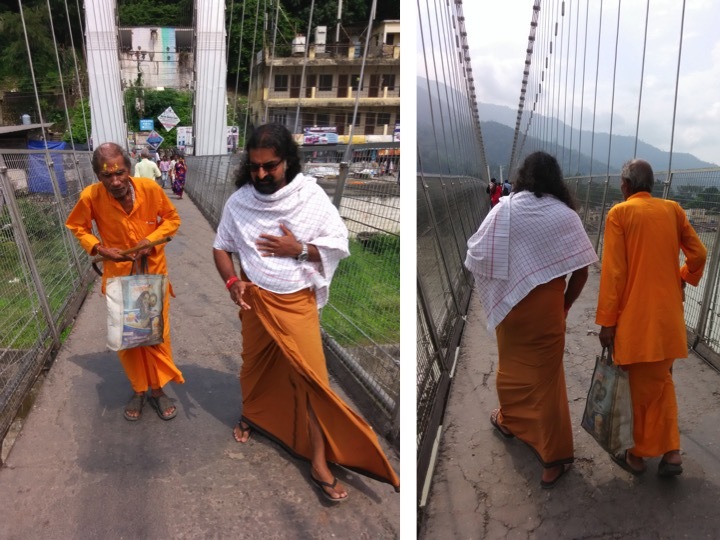 Mohanji and I started walking by the road adjoining the banks of the river Ganga towards Ram Jhula. Mohanji was walking at a very brisk pace and I was trying my best to get ahead of him and take some pictures. His pace was so fast that I captured some nice pictures of the back of his head, a part of his dhoti, half his face, half of the side profile, etc. By the time I ran ahead, turned and clicked, he was right in the face of the camera or past it. 🙂 Once in a while, he would stop and ask me to give some money to a mendicant or beggar. That made it even harder for me to keep up. I consoled myself thinking that it is not easy to capture our Shiva in a camera. I even prayed to him to let me take some nice pictures but that only made me even more adept at capturing blurs. We finally reached the entrance of Ram Jhula. 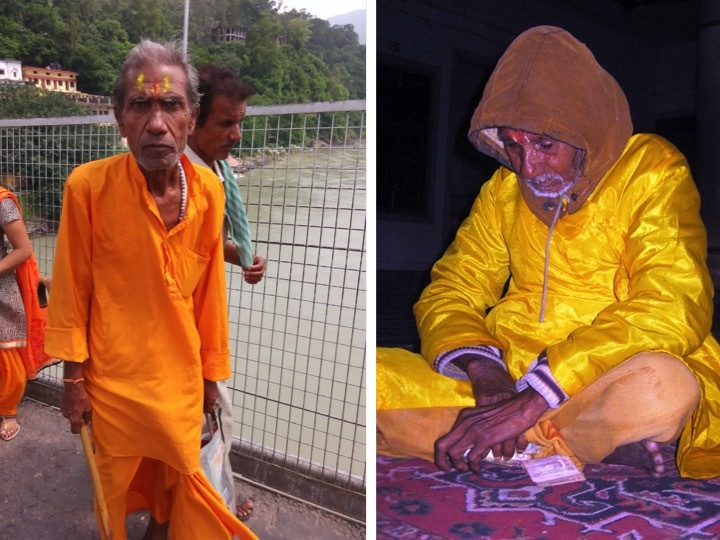 There was an old man sitting at the entrance of Ram Jhula intensely staring at Mohanji. Mohanji walked past him a few steps and stopped. As usual, I was trying to keep pace with Mohanji and almost missed this old man. Mohanji called me and asked me to go back to the old man and give him 100 rupees while he waited. I gave him the money as instructed, touched his feet and took his blessings. He said, “Khush raho, chiranjeevi raho, sukhi raho”. (May you be happy, May you be immortal, May you be prosperous). The old man then started walking towards Mohanji. Mohanji asked him, “Did you have food?” He said, ” Yes. I had food and I also got the money”. Then Mohanji asked him, “What else do you want from me?” He said,”I want to go to Neelkanth”. Then Mohanji asked him, “Do you know where Neelkanth is?” He said,” I will cross Ram Jhula. Then I will come to know”. Then Mohanji asked him, “Fine. Since you know that, may I go?” He said, “Yes and thank you for your grace (blessing me)”. Mohanji walked past him. Mohanji asked me to go back to him and ensure that he has money to go to “Neelkanth”. I went back and asked him if he had enough money. He said, “Someone just gave me money. Wasn’t it you?” I asked him,”Do you need more?” He said, “Give me whatever you want”. I gave him 500 rupees more. I again touched his feet and took his blessings. He again said, “Khush raho, chiranjeevi raho, sukhi raho”. I asked him if I could take his photograph. He consented. When I came back to Mohanji, he asked me if I knew who this person was. I said he looked like Hanumanji. Mohanji said,”Yes. He is Hanumanji. He came to bless us. Just watch, he will disappear soon, He will not cross the bridge. He will disappear most probably from the middle of the bridge”. Bridge signifies worldly existence the here and the hereafter. He said if he crosses the bridge of existence with Ram, He will “know” or merge with Shiva. The message was loud and clear. Hanumanji chose to serve Ram and is happy and contented about it. But he knows that if he crosses the bridge called Ram, (Ram Jhula) he will know Shiva. Hanumanji walked behind us for a while. Then he stopped near the middle of the bridge and sat down. When I looked for him after a while, he was gone. Absolutely no trace of him! Moreover, he looked very similar to the Hanumanji picture posted in the Ayodhya blog post titled Plight of Hanumanji in Ayodhya. Both had great resemblance. Interestingly, the venerable Mamu was telling us the same story of meeting Hanumanji in Ayodhya just the night before. He was a first person witness. He said that Hanumanji had blessed him by saying, “Khush raho” which was what Hanumanji said here as well. And Mohanji said that these days, Hanumanji usually appears to devotees as an old man. Mohanji later explained the significance of the drama that just played out, “Neelkanth means Lord Shiva or the complete annihilation of personal identities. Neelkanth is also a state. A state of collecting and storing poisons of existence at the throat region and not allowing it to enter your system at all, while having nothing to do with it. This also has a deeper significance for the modern man. The suggestion of Hanumanji is not to allow negativity of day-to-day life to enter your system and keep it or remove it at the entry level itself (throat) and remain pure and unsullied always as a great bhakti (devotee) like him. And the other significance is that do not throw out poison because it will contaminate the society. Never throw out anger, hatred, greed and such negative emotions and if you have them, let them stay at your throat level, unexpressed. And when unused, the saturation of it will bring forth nectar of life, the Shivahood. Neelkanth means blue neck and blue color is the color of the poison. Hanumanji is part of Shiva and naturally intends to merge with Shiva. But He is committed to Lord Rama. Bridge signifies worldly existence the here and the hereafter. He said if he crosses the bridge of existence with Ram, He will “know” or merge with Shiva. The message was loud and clear. Hanumanji chose to serve Ram and is happy and contented about it. But he knows that if he crosses the bridge called Ram, (Ram Jhula) he will know Shiva. And instead of me telling Him that I am blessed by His visit, He said “Thank you for blessing me!” Humility means Hanumanji. No expectations. Humble and always in surrender to His master, but with full awareness. Also, He met Mohanji on the bridge. Bridge called the world. Bridge between the here and the hereafter. Highly symbolic. Mohanji did not stop before the bridge to address Hanumanji. He walked past him and stopped on the bridge before he asked me to give him the money. Hanumanji got up, came towards Mohanji and met him on the bridge. The entire episode makes sense when we understand the reason behind an event. Most of us, mostly are watching the show not understanding the story. I was a little lost post this incident. What grace to have the darshan of Lord Hanuman! The tremendous grace to have his darshan didn’t sink into me. It still hasn’t fully sunken in as I write this post. As the whole drama played out, my mind was completely blank. I was just following Mohanji’s instructions without thinking. I touched the person’s feet and took his blessings out of reverence for his age, his ochre robes and because Mohanji was treating him with reverence. Not because I was touching the feet of Lord Hanuman. If only I had an inkling of what was happening and who he was! Sigh! Sob! Sob! Mohanji always says, “Those who have eyes to see will see. The rest have chosen blindness. Let them be.” I guess I am one of the blind ones. I get these experiences through the compassionate grace of Mohanji. I am not even sure if I deserve it but if Mohanji deems it, it must be. So the best thing I can do for now is to hold on to Mohanji’s feet for dear life as best as I can until the awareness sets in. And when the awareness sets in, I can hold on to them even more firmly. I pray for that blessing from Lord Hanuman. Anyways moving on. We crossed the Ram Jhula bridge and started walking towards the Gita Prakashan Vastra Vibhag store to buy dhotis. Along the way, Mohanji asked me to feed bananas to the calves roaming out there. 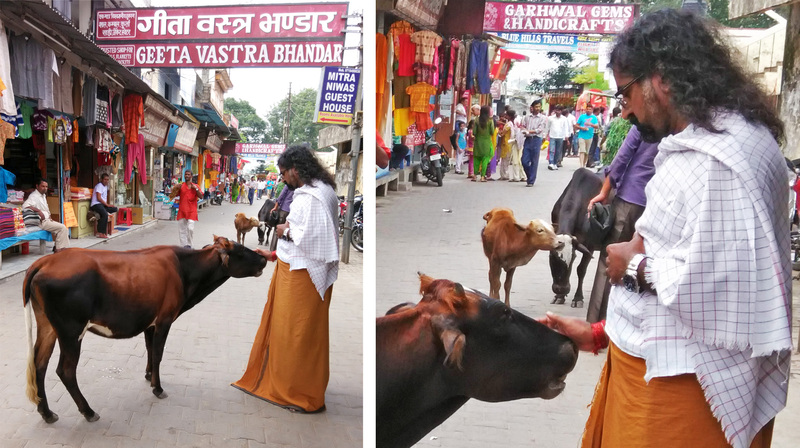 As soon as I walked towards the vendor, the calf and the begging saint followed me. The calf was pushing me and it hardly gave me time to complete the purchase. There was a kind of authority or decisiveness in it that is quite unusual. How did the calf understand what Mohanji told me? Of course the begging saint understood the words. The calf? And it had a commanding attitude or authority about it. Perhaps one of Mohanji’s real army? Even after feeding the calf, it followed me to where Mohanji was standing and Mohanji fed the calf with his own hands. Every being is the same to Mohanji. Absolutely no discrimination at all. Same love. Same treatment. He also asked me to give money and food to some of the beggars and mendicants. The downside of seeing (and sometimes missing out on recognizing) a divine being is that you start earnestly looking for them in every person that vaguely looks similar. Every beggar or sadhu becomes a potential Hanuman (or another master), if you know what I mean. Even animals just in case they choose an animal form! I guess that is what Sai Baba wanted to instill in his disciples when he appeared to them in different guises as a beggar, a dog, etc. to make sure that his disciples saw him in everything. Mohanji selected a few dhotis for himself and a couple of dhotis for the priests for dakshina. We picked up the merchandise and walked back towards Ram Jhula. As Mohanji was walking at his pace, a cow almost stopped him, looked at him and as he took a few steps past her, she turned and looked at him. Mohanji stopped immediately and asked me to buy two apples. He took the apples and fed a passing cow, caressed her and stood next to her for a while. It almost felt like he was having a conversation with the cow. Mohanji fed the calf with his own hands. Every being is the same to Mohanji. Absolutely no discrimination at all. Same love. Same treatment. 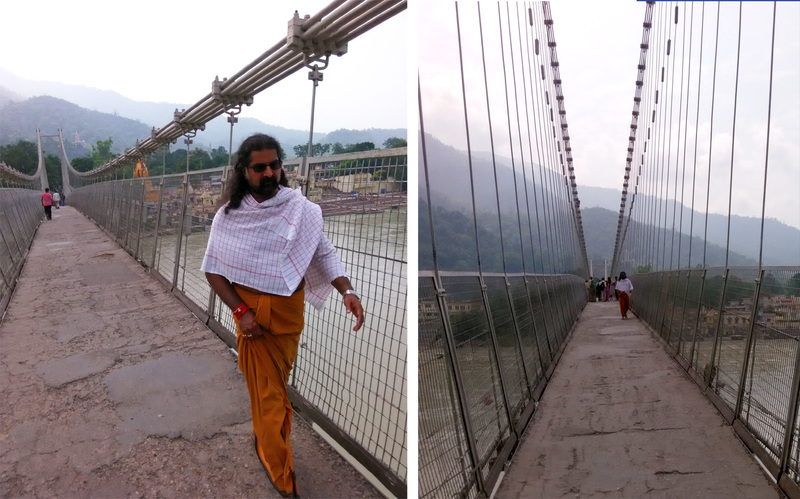 We quickly crossed the Ram Jhula and headed to the Sivananda ashram. I looked around for signs of Hanumanji but he was nowhere to be seen. After crossing Ram Jhula, we walked down the road adjoining the river towards the Sivananda ghat that was the pre-decided meeting point. There is a concrete staircase that winds it way down from the entrance on the road towards the ghat. There are several spots around where people can sit and meditate in the serene presence of the river Ganga. We selected a spot facing the river and sat there in the shade. It was slowly getting hot with the sun blazing down on us. There were a few people hanging around near the ghat. A few renunciates from the Sivananda Ashram passed us by walking towards the river to take their morning dip in the river Ganga. I used the time to capture Mohanji’s photos in different moods and angles as best as I could. Thankfully, our Shiva consented this time to let me take some nice pictures. Slowly, the people there started moving out and soon we were the only people left on the ghat. After a long while, the priest Kukretiji and his apprentice Sharmaji showed up. Mohanji and the priest exchanged pleasantries. The priest was a nice jovial guy. He enquired about Mohanji’s current location and activities. He enquired about me and told me that there was a very famous politician in the post-Independence era with the same last name and I should look him up. He discussed with Mohanji on the expectations of the ritual and explained the proceedings to him. He asked Mohanji to take a dip in the river Ganga while he setup the place and organized materials for the ritual. I went back to my role as the ace photographer in charge of the photo shoot. The ritual was elaborate starting with the invocation of the various deities and giving various offerings to them. Then the offerings of holy water, milk, flowers, rice, etc were made to the ancestors and to Ammu. The ritual culminated with creating the ritual offering, the pind (referred to earlier). The pind was adorned with flowers and then offered to the ancestors and to Ammu setting it afloat on the river Ganga. The offerings of milk and water were made to the Sun and the river Ganga. 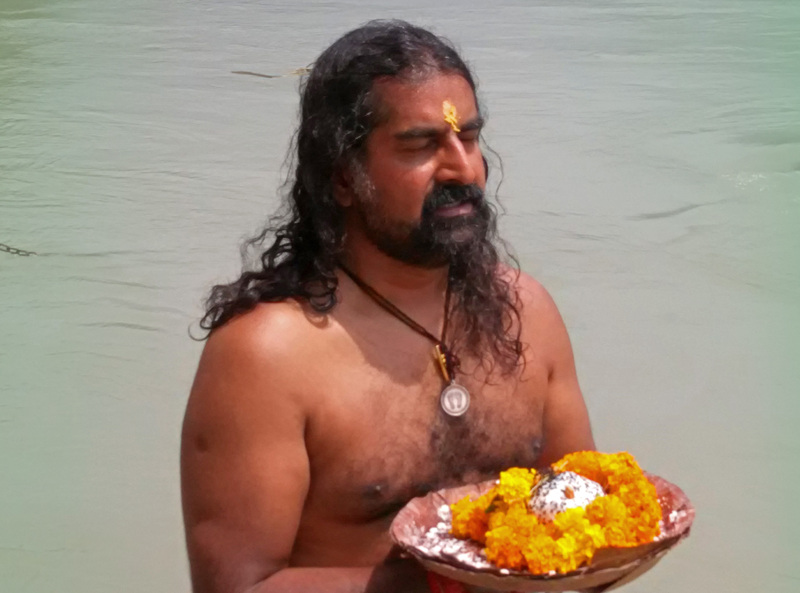 Finally, Mohanji was asked by the priest to take dips in the river Ganga to culminate the ritual. Mohanji offered the dhotis and money as dakshina to Kukretiji and Sharmaji and pranaamed (saluted) them. I took down their contact numbers for posterity. Mohanji thanked them and they went on their way. There was a visible change in Mohanji’s physique after his meeting with Hanumanji. He became quite muscular as if he did a number of pushups unseen to human eyes. The photos could capture a bit of his then physique that keeps changing with situations and reasons. All through the while, I was clicking away to glory. My camera really heated up abnormally and slowed down completely to the point where I had to anticipate and click because I could not see the frame in time. This has never happened before. The interesting thing to note is that I still managed to get some nice pictures. My guess is that Mohanji must have been in an expanded state through the ritual and his energies were affecting my camera. Mohanji later mentioned that the ritual went very well. All the deities and ancestors were very happy with the ritual. All the auspicious signs were there. Mohanji took a change of clothes and sat down in the shade. I asked Mohanji if I could take dips in the river. He told me to go ahead and take my time. 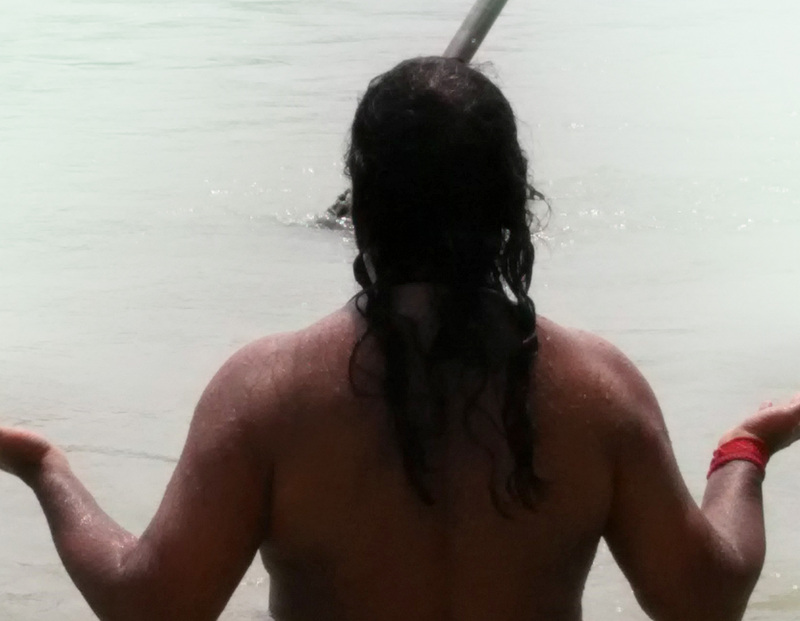 I decided to take 108 dips in the river Ganga in the name of Mohanji. I walked down the steps to where the water was touching the lower part of my chest. There was a strong undercurrent that kept sweeping me forward. There was about a meter of space on the platform where the step ended. I had to push the current and walk back after every 2 dips to prevent getting swept off the platform completely. Beyond the step, the river flowed downstream with not much to hang onto for support. Even though I can swim quite well, it would have been a bit hard to swim to the shore with this strong undercurrent. I took the dip while holding the thought of Mohanji in my mind. Slowly and steadily, I kept taking my dips. But the fear of getting swept off the platform was always there. I first took the dips with my eyes open repeating the forward and back routine. Then, I closed my eyes and took the dips but kept opening my eyes to ensure I wasn’t too close to the edge. In between, I kept losing count and recounting so I started doing extra dips to make up from where I left off. Finally, when I crossed hundred, a thought occurred to me that this demonstrated my lack of faith in the protection of the Master. I still kept repeating my eyes open eyes closed routine. Finally, I decided to test my faith and just keep my eyes closed and do the final dips. I kept getting pushed forward and I had no idea where I was relative to the edge. As I got close to the edge, a safety chain bumped against my knees and I easily got hold of it. I held on to it and finished the last of my dips. My faith in the Master’s protection was validated. 🙂 I don’t know how many dips I finally did but it was well above 108 with all the recounting. I was feeling nice and tipsy with a sweet cool ice-mint feeling inside my skull (similar to what you have in your mouth when you chew strong ice-mint gum). I just stood there and enjoyed and savored the feeling. Finally, I decided to get out of the water, walked up the steps and went up to where Mohanji was sitting. At about that time, a family of 7-8 people just walked in. 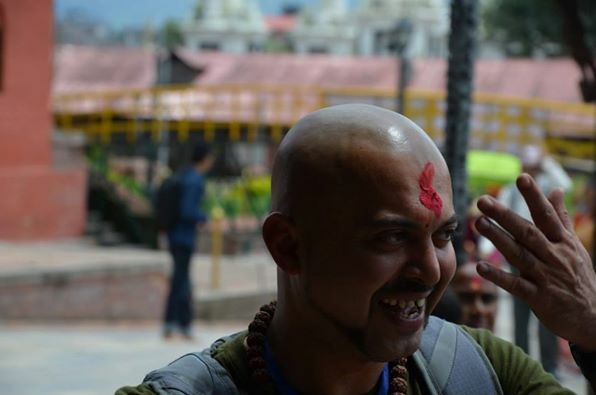 It was then that I noted that from the time the ritual started to when I got off the platform, it was only Mohanji and I (other than the priests) on the ghat. Interestingly, the Divine had arranged for the ghat to be available to us exclusively and that too on the auspicious day of Krishna Janmashtami. How cool is that? Later in the night, Mohanji asked me how many dips I took. He said that taking the dips in the river Ganga on this auspicious day was a blessing. That’s when I realized that I had taken dips in the river on Krishna Janmashtami. Infinite prostrations to the Master who arranges for everything in perfect divine order! We were supposed to meet a person who had been coordinating to meet Mohanji in Rishikesh for the last few days. 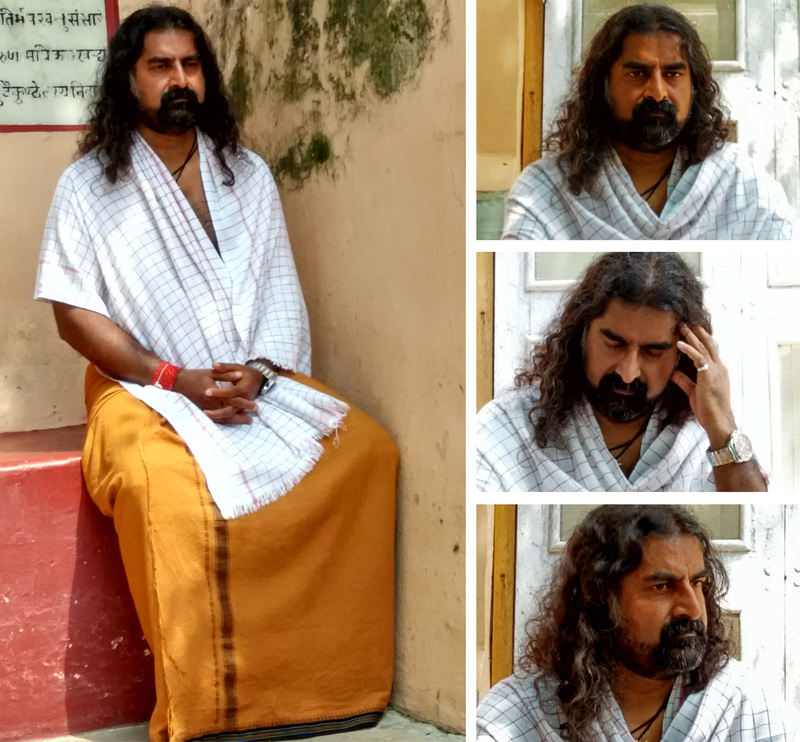 He was an old devotee who has been connected with Mohanji for a long time by the name of Ashutosh. He is a manager in a bank. Last year, he wanted to meet Mohanji in Dharamshala. On a whim, he decided to come down to Dharamshala and take a chance. He stayed for two days but could not meet Mohanji. He even requested Mohanji’s team that he only wanted to see Mohanji from a distance. But even that was not possible since Mohanji was busy with some important things during that time. He had been following up with Mohanji team for a long time. When he found out that Mohanji was going to be in Rishikesh, he requested Mohanji to allow him to spend some time with him. We had invited Ashutoshji to have lunch with us at the hotel after the ritual. We walked back to the hotel to take a quick change of clothes. Mohanji checked his messages and calls and, after some time, we headed to the hotel reception where Ashutoshji was waiting for us. We headed to the restaurant below. We hadn’t eaten anything since morning so the food tasted divine. Mohanji enquired about Ashutoshji and his family. 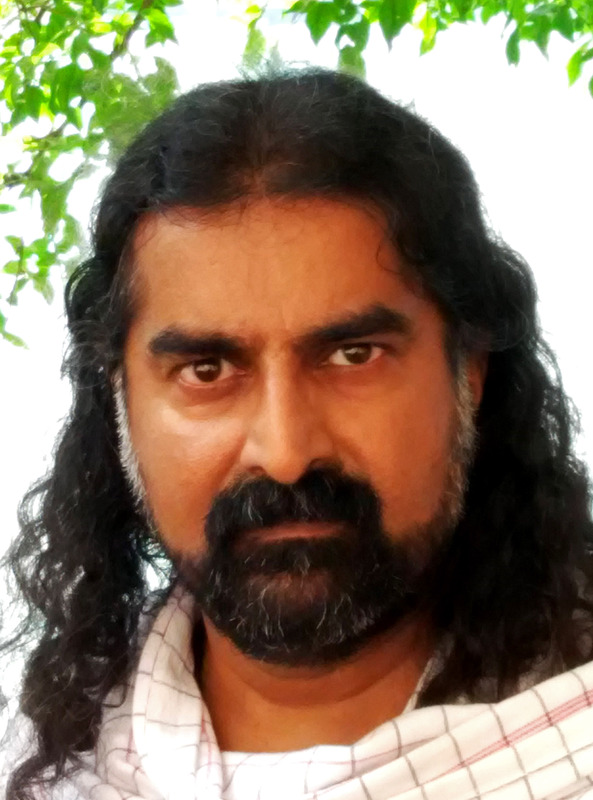 Mohanji gave him a few incisive blunt insights in his no-nonsense direct manner especially on inability to hold on to the connection due to mind and ego issues. I could really see the resolve in Ashutoshji to get the favor of Mohanji. At one point, Mohanji remarked to me that it is not easy to “meet” Him. That made me realise how fortunate I am to be able to spend so much time in close proximity with Him. A real lesson not to take the Master’s grace and outstretched hand for granted. What can be gained so easily through the Master’s grace and compassion can be lost even faster through the ego and mind’s foolishness. After having lunch, Mohanji wanted to go the Sivananda ashram to meet Swami Govindanandaji. Mohanji was standing outside the hotel chatting with Ashutoshji. Out of nowhere, one baba (renunciate) came up straight to Mohanji. Mohanji started turning the pages of the book and came to a page that had a picture of Balaknath (who looked very similar to Rakhadi Baba). Balaknath was a famous disciple of Lord Gorakshanath. Under the photo of Balaknath was the famous shloka of the Gita “Yada Yada Hi Dharmasya Glanirva Bhavathi Bharatha, Abhyuthanam Adharmaysya Tadatmanam Srijami Aham” – the eternal promise of the Lord to take an avatar whenever Dharma (righteousness) is under threat from evil. I felt that the baba was in some way referring to Mohanji’s past life connection to Balaknath and the verse was pointing to Mohanji’s avataric incarnation in these troubled times. Twice the baba tried to touch Mohanji’s feet but Mohanji held his hand lovingly and firmly and would not allow it. Mohanji asked me to give the baba 500 rupees. Mohanji asked him, ” Are you happy now?” He thanked Mohanji. Mohanji again asked him if there was anything else he could do for him. Then he said that he wanted something from Mohanji. He said he wanted a white shawl or a Ramnaami chadar (shawl with the name of Lord Ram on it). Mohanji asked me to go with the baba and buy him the shawl. In the meantime, Ashutoshji volunteered to take him to the market and buy him the shawl. Mohanji agreed and asked Ashutoshji to go with the baba and buy him what he needed. In between, the baba told something to Mohanji which sounded like “I know who you are and I came to you knowing your true form. Even though you are not covered in white, I do recognize you.” I could not understand what he meant and I asked Mohanji what it meant. Mohanji suggested us to ask him directly. When Ashutoshji asked, he said in a stern voice. “Mohanji asked you to do something. Ask no further.” This was quite unusual for a monk who begs for a living. I asked and he said something else. He did not give me a clear answer. Once the plan was finalized, Mohanji asked him. “May I go?” Again he tried to touch Mohanji’s feet and Mohanji prevented it gently, but firmly. He blessed us to leave. I could not really understand the drama that was being played out there. He was very pleased with Mohanji and in a way blessed him through his eyes and words. Mohanji and I left for Sivananda ashram to meet Swami Govindananda ji while Ashutoshji left with the baba to the market to buy the shawl. I asked Ashutoshji to meet us at Swami Govindanandaji’s residence in Parvati Kutir at Sivananda ashram once he was done with the purchase. We walked towards the Sivananda ashram. The ashram is a prominent landmark on the main road. We entered the ashram gates and headed to Parvati Kutir where Swami Govindanandaji stays. The ashram is a simple and peaceful place with many old buildings connected by roads winding their way upwards. The place provides a good warm up exercise since you have to go quite a distance uphill to reach anywhere. 🙂 On a serious note, the calm that it exudes is pristine. I mentally bowed down to the place made holy by the divine feet and presence of the great Swami Sivananda. Swami Govindanandaji and Mohanji are deeply connected to each other. I had the wonderful opportunity to meet him once before during our Rishikesh retreat. He is a very unassuming, humble and simple personality. Mohanji has a very high regard for his spiritual stature. He heads the publications department for the Divine Life Society (Swami Sivananda’s mission). He and Mohanji go a long way back. I had read that he provided the inspiration to Mohanji to start Ammucare when Ammu passed away. In Swamiji’s words, “Do something to alleviate the suffering of the children of Mother Earth and you will find peace”. We were told when we met Swamiji the last time round that Bhagavan Sathya Sai meditated in the room next to his. He received Mohanji very cordially as one welcomes an old friend. 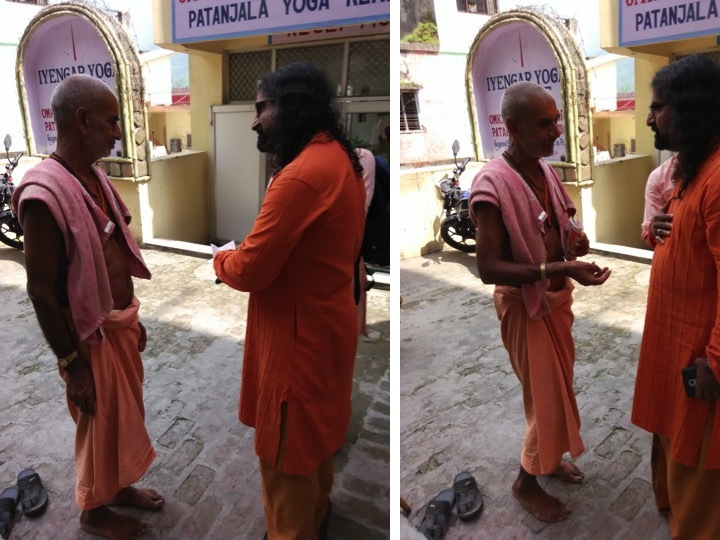 Mohanji gave Swamiji the special dates that he had gotten from Dubai for him. I prostrated at the feet of Swamiji. They conversed mostly in Malayalam where I gathered that he was enquiring about Mohanji’s family and work. Mohanji told him about the extensive overseas trip that he concluded last month. They discussed about his future plans. 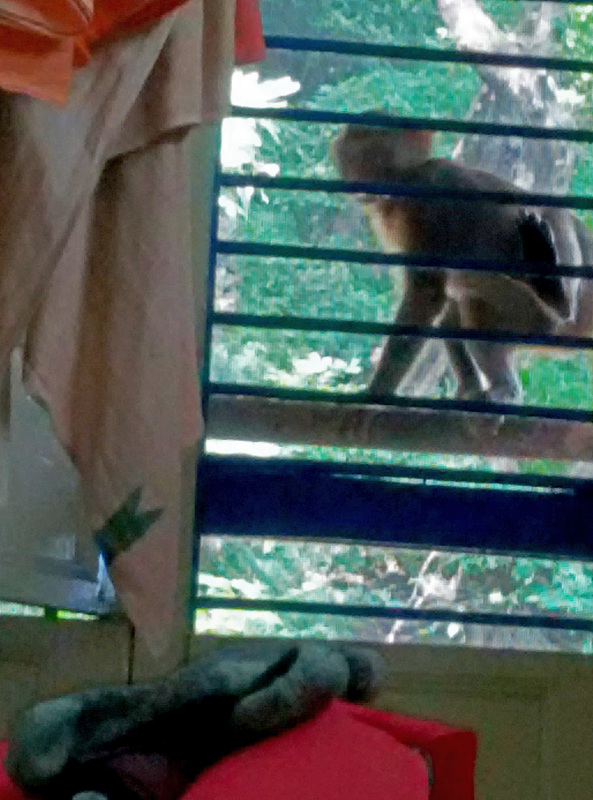 While they were talking, I noticed a monkey in the window trying to get their attention. While walking back to our room, Mohanji casually remarked, almost to himself, “In this incarnation, I will play with a lot of people. Only a few will understand me or the game I play. Many won’t. They will lose me. I will lose nothing”. When I asked what he meant, he brushed it off and did not explain any further. Ashutoshji later joined us in the hotel room. 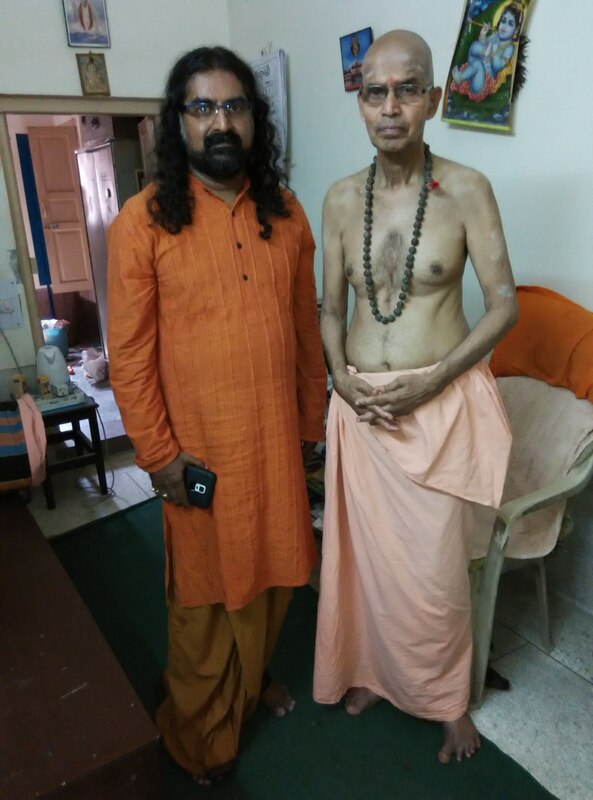 Mohanji enquired about his experience with the baba. He asked Ashutoshji what the baba told Ashutoshji about Mohanji. Ashutoshji related his experience with the baba. He said that the baba took him to a local market and enquired in several shops but could not find the white shawl. In one shop, the baba was offered a saffron shawl but he declined saying that it was meant for sanyasis (renunciants). He was specifically looking for a white shawl. The commanding and authoritative tone in which he was talking to the shopkeeper was surprising and in a way annoying to Ashutoshji. It was not expected from a begging monk. The baba then told Ashutoshji that they would go to the main market. 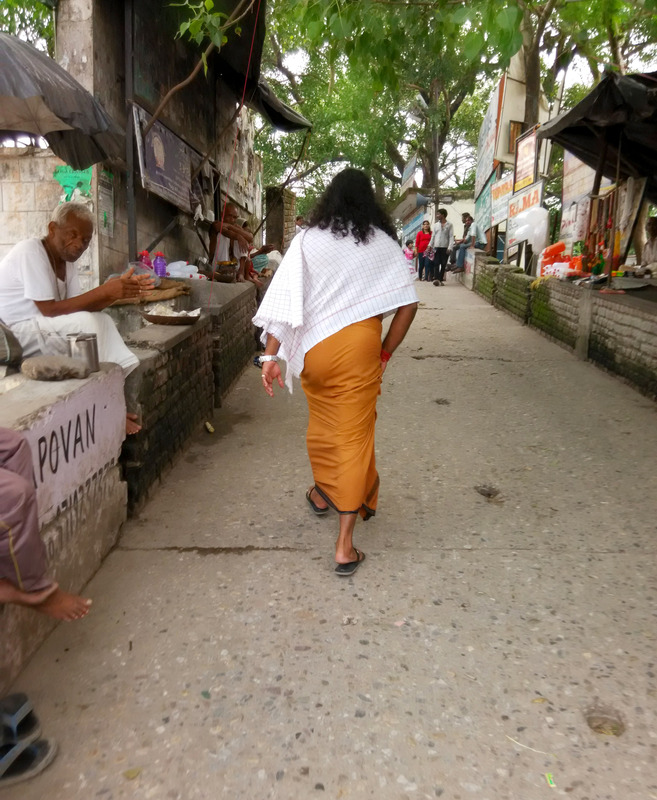 The baba was walking very fast and Ashutoshji was following – almost running behind him. Ashutoshji started observing his walking style. The baba had a confident gait with a walking stick held firmly in his left hand and was walking with a dynamic pace much faster than Ashutoshji. It was amazing to Ashutoshji that the baba had asked for bhiksha (the act of giving alms). Yet he was the one following the baba around and the baba was deciding everything according to his own whims without even bothering to ask Ashutoshji. Ashutoshji started getting frustrated with the baba’s attitude. He wondered, “Who is this baba who was turning the concept of bhiksha topsy turvy?” For a moment, Ashutoshji thought, “Why can’t the baba just take money from me and buy it himself? Why is he wasting my time? I wanted to be with Mohanji.” But then, a second thought came along that if Mohanji has asked me to do it, then there must be a specific reason and I must do this. 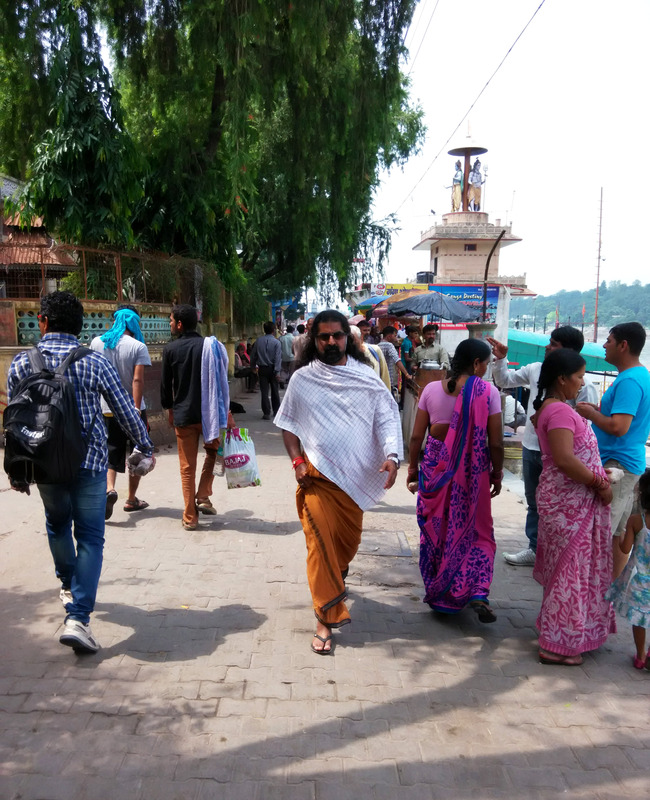 While walking with Ashutoshji, the baba enquired about the location of Mohanji’s ashram. Ashutoshji told the baba that Mohanji lives in Dharamshala in Himachal Pradesh. Suddenly, the baba called out to an autorickshaw driver in a rough and commanding tone to stop the vehicle. He sat next to the driver and asked Ashutoshji in a very soft tone to sit on the backseat. The baba asked the driver to take them to the main market. On reaching the main market, they alighted and the baba asked Ashutosh to pay in a very authoritative way. The baba asked a local hawker for directions to the garment shops. The hawker was not responding properly. The baba scolded the hawker and asked him firmly to guide them properly. They looked through several garment shops. Finally, they reached a shop where they showed him a shawl for 2000 rupees. He said that wasn’t what he was looking for. He was talking to the shopkeeper in the same authoritative tone. Finally, he found what he was looking for – a 5 meter long pink cotton shawl for 200 rupees. He told Ashutoshji, “The Swami (Mohanji) has come from “far away”. He is a good saint. I have not asked this from anyone and I will not ask this from anyone except him. Only from Swamiji (Mohanji).” He further added, “Sawa lakh se bhi jyaada kimti hai ye daan” (this offering is worth more than the offering of a hundred and twenty five thousand rupees). Ashutoshji asked him if there was anything else he could do for him. He asked for 10 rupees to take an autorickshaw. Then he placed his hand on Ashutoshji’s head and blessed him. Ashutoshji noticed an unusually nice fragrance coming from him. He took the shawl and decided to take his leave. Finally, Mohanji asked him, “Do you know who he was?” Ashutoshji was anyway surprised on Mohanji’s earlier line of questioning. He assumed that the baba was a siddha purush (saint) since Mohanji was treating him with utmost respect. However, he couldn’t figure out who he was. Mohanji finally asked him, “Did you see Sai Baba?” Ashutoshji was not prepared for this. He didn’t expect it to be Sai Baba of all people. Mohanji asked us to look at the photographs that I had captured. It happened so fast that I only managed to take three photographs. Mohanji asked us to look at the legs of the baba and compare it with the picture of Sai Baba. As an aside, when I sent the pictures to Sandeep Mishra, he noticed the clear face of Sai Baba from Dwarkamai on the right leg of the baba. Mohanji asked Ashutoshji if he found it out of the ordinary that a begging monk should demonstrate that kind of authority and confidence in his behavior. Then Mohanji explained that Baba’s nature is commanding and authoritative. In Mohanji’s words, a king in the guise of a clown will still act like a king. That is his basic nature. Sai Baba had himself come down to give Ashutoshji three important lessons – 1) a dressing down to demolish his ego. Ashutosh is a manager in a bank. He might have been carrying the pride and ego attached to his position. He is a great fan of Mohanji. And he was craving for his time and togetherness. After months of waiting, he meets Mohanji. And almost immediately, he was asked to go after this Baba. The longer the Baba took to choose his stuff, the more frustrated Ashutosh became. He had to literally run the streets with Baba, not having any awareness as to who this old man is. He took him through streets, shops and made him pay for their travels, until he found what he was looking for. He did not buy anything until he found the exact thing which he was looking for. The tedious trails made Ashutosh impatient and angry. He had thought it was a simple thing. And he was eager to get back to Mohanji as he knew that Mohanji will leave the place soon to catch his train. Baba tested him, his devotion to Mohanji, his commitment, his patience and finally blessed him. Also, the long wait to meet Mohanji bore fruits in a much larger dimension where he got to travel with Baba and take His blessings. Also, Baba never allowed him to sit next to him in the vehicle. He allowed him to sit at the back. Only those with equal stature are allowed to sit next. In this context, the vehicle driver is insignificant in this story. Ashutosh was also quite annoyed and concerned with the commands and authoritative language of the Baba. He found it inappropriate to his cultured mind. Another barrier broken here. His heart brimmed with anxiety of missing Mohanji again, lapse of time, anger towards the behavior and ways of Baba and finally, after all the tests and turbulations, he got sweet nectar of divine grace. 2) Baba tells him to follow the Guru’s commands without question. That was what he meant when he sternly said, “Mohanji asked you to do something. Ask no further.” What an immense blessing in return for the resolve Ashutoshji demonstrated to pursue Mohanji at all costs. One interesting aspect that I thought about, in hindsight, is that both the masters said, when asked, that they had food. It probably could be due to the fact that Mohanij always offers food to both of them before eating. So they had in a way received and “eaten” the food that was offered by him. Anyways, moving on. It was time for us to head to the railway station. Mohanji asked me to get holy water from the river Ganga for taking back with us. I looked around and wondered if the sand from the banks may make the water murky and dirty. I was also looking for a clean spot to fill up the water. I asked a person standing on the steps and he pointed to a couple of spots around – almost as if saying that it didn’t matter; it was all good. I then picked a spot and stood at the edge of the bank and starting filling water in my bottle. He came by, stepped into the water and himself offered to fill up the bottles with water away from the shore. I thanked him profusely and headed back to our room. Before leaving the hotel, Mohanji said that he wanted to go to visit the river one last time. Ashutoshji wanted to take photos of Mohanji. So Mohanji asked him to come along and take some pictures by the shore. Ashutoshji had specially brought an SLR camera to take the pictures. 100 (even higher than what the exorbitant charge we paid earlier). Since Mohanji specifically asked me not to haggle too much with the autorickshaw driver, I told him that we had paid 80 on the way here. He agreed. Mohanji saw an old man and asked us to check if he wanted to be dropped off. He was more than happy to tag along. When we reached the station, Ashutoshji paid the fare for the rickshaw. Mohanji asked him to pay the autorickshaw driver 20 rupees more. As we were walking to the train station, Mohanji told us never to bargain with poor people. He said that if someone can be made happy by 10 or 20 rupees, we should go ahead and do it. It does not mean that we should let people fleece us. But he said that it is always good to try and make people happy if we have a chance. As an example, he said that this autorickshaw driver could feel the love in people and give someone a free ride tomorrow. So we should try as much as we can to make people happy in our own way as per our means. The train was already docked at the railway station since Rishikesh was the starting point. We boarded the train and got to our seats. Ashutoshji wanted to spend the last few moments with Mohanji before he left. Mohanji asked me when the train would arrive in Pathankot. The message I received from the venerable Mamu only mentioned the departure time. Ashutoshji offered to get that information online. Suddenly he realized that the train went up to Roorkee where he lived and was headed for after taking Mohanji’s leave. He immediately decided to take a chance and board the train even though he didn’t have a reservation. He decided to immediately buy an unreserved ticket and then discuss the situation with the ticket collector to stay in our compartment. Through an innocuous query, Mohanji gave him an opportunity to spend a few more hours with him in the train. He was more than elated. Ashutoshji rushed to the ticket office and managed to get in just minutes before the train started leaving the station. As the train moved along, Ashutoshji requested Mohanji for permission to massage his feet. Mohanji consented. Ashutoshji started to massage Mohanji’s feet with a lot of love. Mohanji gave certain directions for Ashutoshji to follow. An interesting side note is that when the ticket collector came asking for the ticket, Ashutoshji just told him that he was headed to Roorkee. The ticket collector just nodded and did not even bother to check his ticket. He just let him in for free!!! Eventually, the train arrived at Roorkee. 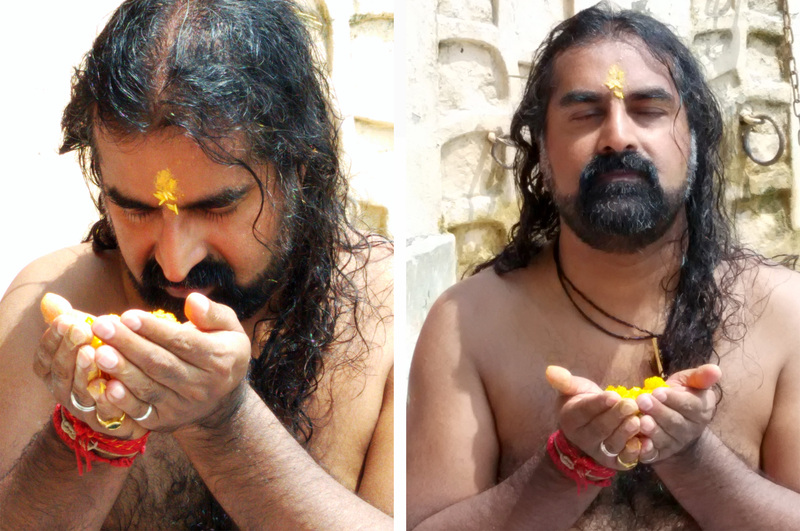 Ashutoshji took Mohanji’s blessings before taking his leave. This time round, the railway gods were probably not appeased because we got the seats towards the side of the train. The lower berth towards the side of the train is made by folding two adjoining seats. The adjoining seats are never on the same level (much like the mind of a man and woman). This results in a gap near the lower back that makes sleeping on it uncomfortable. The venerable Mamu asked me to speak to the ticket collector and get Mohanji’s seat changed to a regular lower berth. When Mohanji heard my suggestion, he categorically said that “I don’t want any favors to be taken on my behalf.” Since the venerable Mamu had already warned about Mohanji’s position in this matter, I quietly slinked away and go to the ticket collector. But there were no replacement berths available. So unfortunately Mohanji had to suffer through more discomfort through the long journey back home. Mohanji never takes any favors and always gives preference to others. As for me, the railway gods decided to give me an experience of how it feels when hell freezes over. I had both the AC vents running full blast on my body. I was planning to stay awake since the train reached Pathankot at 2:00am in the morning. But the frigid cold got through my resolve and I hid within the thin sheets that barely kept the cold air out. I managed to get a couple of hours of sleep until the alarm beeped me out of my cold storage slumber an hour before the scheduled arrival time. It was time to stand vigil and ensure that we do not miss the station. Mohanji probably knew of this and insisted that I set an alarm just in case I slept. That did come in handy since the alarm woke me up in the nick of time. Finally, after what felt like eternity, we finally landed at Pathankot. I had informed Sher Singh aka Mooch well in advance to pick us up from the railway station. Mooch was there to welcome us and he quickly escorted us back to the ashram SUV. Mohanji gave Mooch a free pass to step on the gas and drive us back to the ashram as fast as he could. Needless to say, Mooch took to the suggestion like a fish to water. We were literally flying back on the wings of the SUV aided in flight by choicely placed potholes and Mooch’s breakneck speed. Mohanji asked me in between if I would like to have some tea. I would have loved to but didn’t want Mohanji to wait so I declined the offer. Thanks to Mooch’s flying ways, we reached the ashram quickly and not too worse for wear. As we entered the ashram, Mohanji requested Devadasji to make some tea for him. It was already 4:30am in the morning so I decided to forego sleep. I was pleasantly surprised and infinitely grateful when Devadasji took the effort to make a piping hot cup of regular chai just for me (Mohanji has only herbal tea without milk or sugar). The Master listens in and grants our every need no matter how small. So as I sip on the tea in the cool morning and have a smoke, I bow to Mohanji in gratitude for the immeasurable grace that he showers on my undeserving self and hope that some day I prove myself worthy of his unconditional love and grace. Thank you so much for posting this satsang. Such a divine and noble experience. What a wonderful narration!If there is one thing that I don’t find in tune is the writer’s self-deprecating tones at times? Indeed you are Blessed and Specially hand-picked for the Master’s mission. Humility can certainly go hand in hand with the consciousness of one’s privilege! Jai Sai Ram!Also let me know if Mohunji has any plans to visit chennai or even tamilnadu. Beautiful and interesting narration and hard to trust but divinity in Man helps him to observe the worldly incidents and understand symbolically the various ways of ‘Almighty’. In this context, Jagatguru Shankar Acharya is a good example when he along with his followers looked upon an old couple as Lord Shiva and Maa Parvati and four dogs as four Vedas. May Almighty and noble souls of all pious people kindle good thoughts in us to perform appropriate acts. With best regards to all. Rajeshji, Beautiful narration. Your words literally transport us to the time and place of the happenings with Mohanji. Keep up your good work. You are indeed blessed soul. 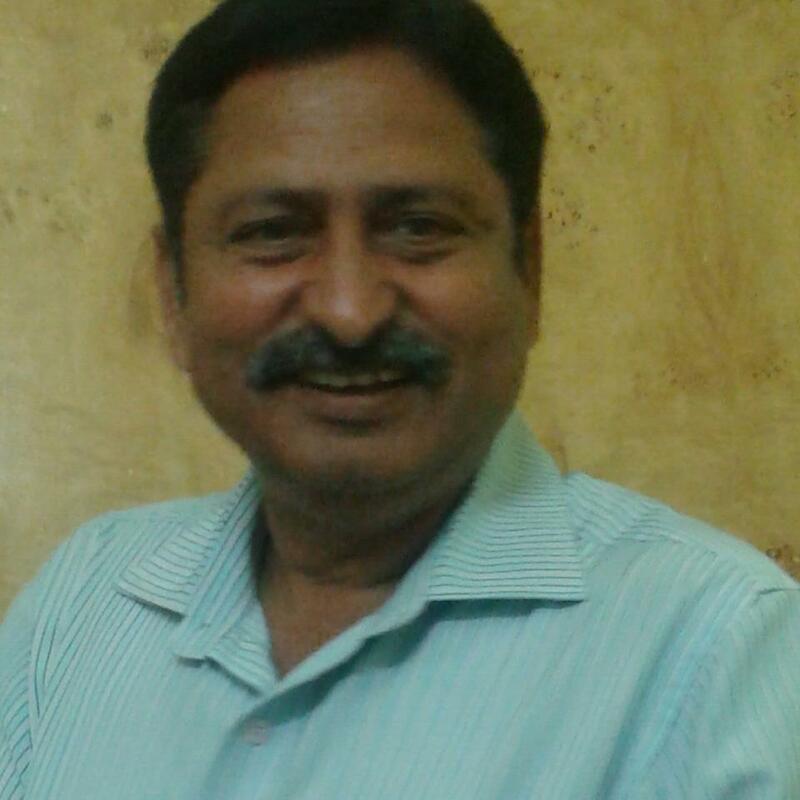 Jai Mohanji. Getting to read this after almost a year-Most of the details are not green in my memory.Again, I simply can’t help applauding you for having captured so many subtle things in this beautiful write-up ! Indeed a must-read especially for any one who wants to travel with The Master !How timely it is put up at the Face Book !Special Grace !